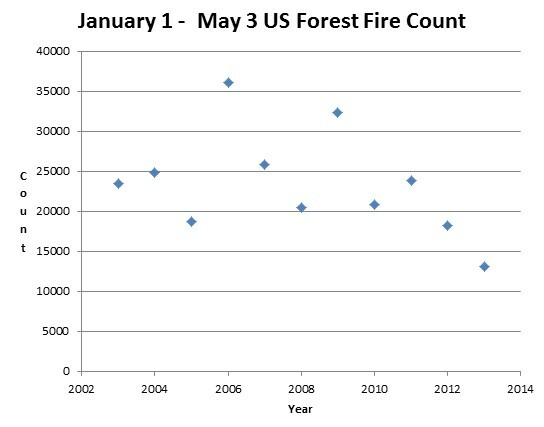 2013 is having the coldest spring on record, the fewest tornadoes on record, and also the fewest forest fires on record. The Guardian reported earlier that “much of Southern California is burning” – though they have since removed that text from their web site. 15,849 acres have burned in California, which is .015% of the state’s 104,765,440 acres..
.015%, that puts it into perspective. To watch the media though you would think the whole state was burning. California burns every year. Ice melts every year. The four California seasons — Drought, Fire, Flood, and Earthquake. 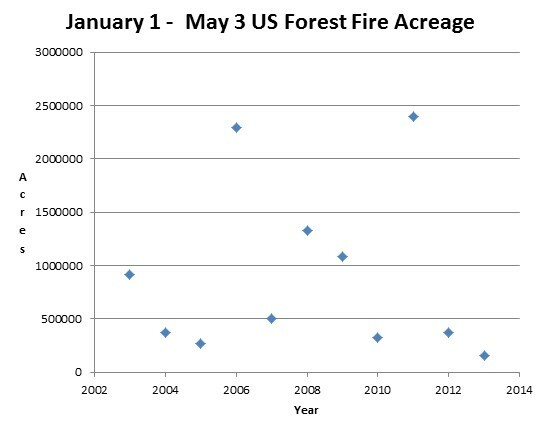 Wait till later this summer when the beetle killed forests of Colorado start to burn. Each year we are forced wait to permanently rid ourselves of this problem, increases the problem; and to blame anyone but the environmentalists for this coming travesty would require that we all bury our heads in the sand. The poor condition of the forests in Colorado could have been solved, or ameliorated, decades ago if not for the interference of environmentalists who, somehow, feel they were annointed by a higher power to to understand the exact relationship between man and nature. Plant more saplings between the trees that should help. The cold winter will severely damage the propagation of mountain pine betels and spruce budworms that have be decimating western forests. The mountain pine beetle infestation is over, at least in Colorado. Alarmists just forgot to mention it. Steven Goddard, you should not play down the wildfire hazard in California this year. It is a drought and I suggest this is due to the cold PDO reducing precipitation. The colder the globe, the drier the globe. For any incremental warming of the earth, twice as much of the resulting increase in evaporation takes place from the ocean rather than the land. Therefore, over land there is twice as much increase in precipitation as increase in evaporation. How can it be claimed that warmer climate is not wetter? Alaska is the second wettest state. Arizona is the driest. Warmth and precipitation don’t correlate very well. -Are you arguing that we have global warming yet fewer tornadoes or global cooling? If the latter, are you conceding that global warming means more tornadoes? Frequently you seem to argue like this, defeating your own argument. I’m not arguing about anything. I am just presenting facts. It seems like you are presenting facts that stump you. It seems to me that you have the mind of a child. It is quite obvious that the alarmists are claiming all sorts of disastrous effects from AGW, including worse and more frequent hurricanes, tornadoes and fires. Steve is simply demonstrating just how off base the alarmists have been with respect to those inaccurate and highly misleading claims. That should not be very difficult to comprehend. What is childish about suggesting that you might present on your blog issues for help from others? I don’t see the world in black and white. Odyessus got himself in trouble by imagining that he was in control. We are not. ruck 1 (r k) n. 1. a. A multitude; a throng. b. The undistinguished crowd or ordinary run of persons or things. 2. People who are followers, not leaders.